TOP CFA members and Bellarine MP Lisa Neville were at the Wallington Fire Brigade on Sunday, for the handover of its second tanker. CFA Operations Officer Ian Beswicke and Assistant Chief Officer Bob Barry were at the handover – 10 years in the making. Wallington Brigade Captain Craig Warren said it was an auspicious occasion. He said former members Tim Monahan and Rhys Esler, and current member Alistair Drayton first raised the need for the tanker a decade ago. 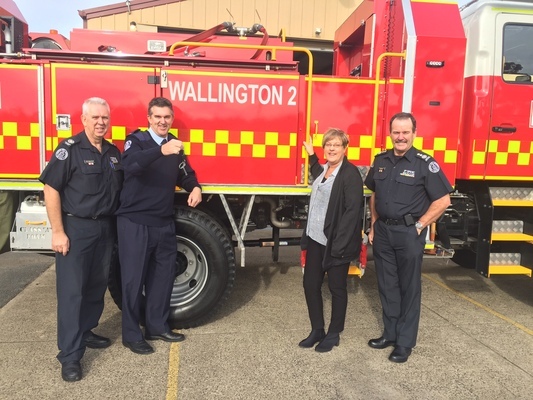 “For the 20 years that I have been associated with the brigade, Wallington has made itself available for every major fire campaign,” Mr Warren said. These campaigns, Mr Warren said, would take the brigade’s tanker away, leaving Wallington exposed. After years of sausage sizzles, and garage sales, the brigade raised enough money to apply for a government grant for the tanker. The bid was successful and the tanker arrived in Wallington last November. After four weeks of training the brigade put it into operation. A week later it deployed the tanker to the fires that devastated the Otways last year. 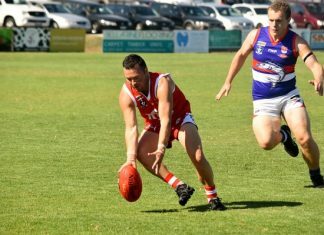 “It has already made a significant contribution to protecting the community,” Mr Warren said. “I’d like to thank the Victorian Government and the CFA for making Wallington Tanker 2 a reality.